MC rang me the other day to see if I thought it would be a good idea to take the horses off to the nearby Ecuries de Mane to practise a few things there. 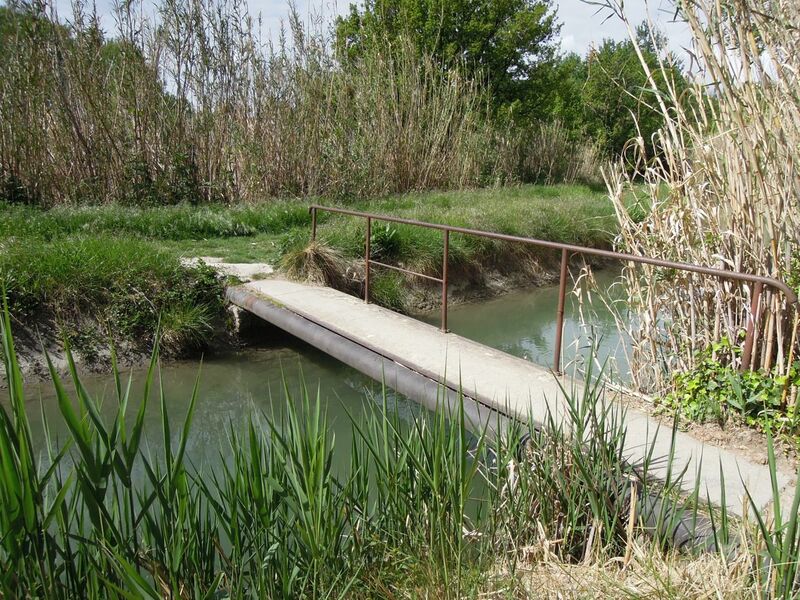 Specifically, a passerelle, or footbridge. Great idea! Practising off-site is always a good thing to do. We arranged to leave at 9am on Friday. Quieto needed some preventative maintenance first, though. MC was really worried about him. 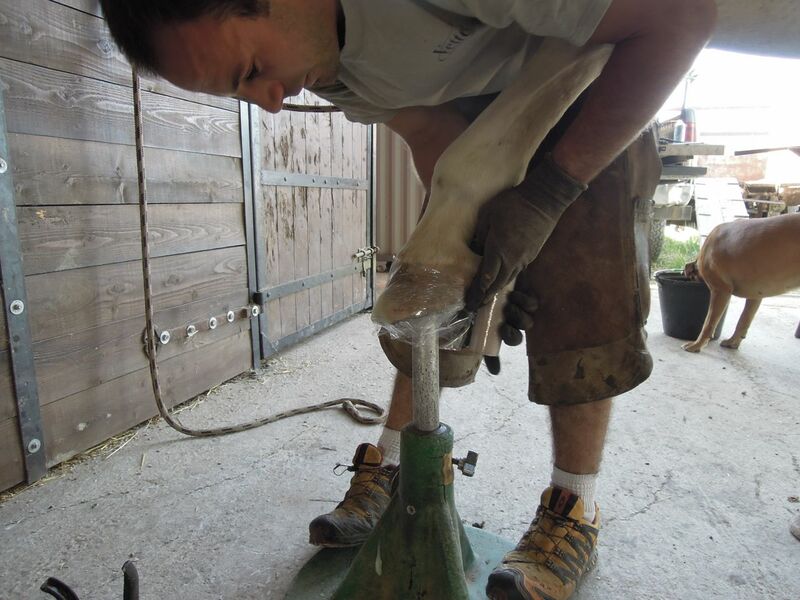 He hasn’t got the best feet in the world anyway – he came to her with laminitis. 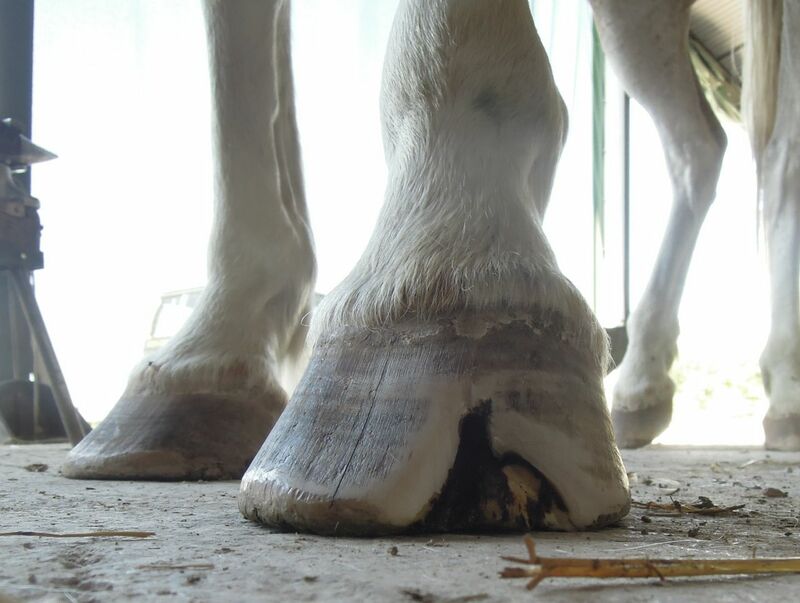 She’s been using his hoof boots all the time recently, because of the crack (crack just doesn’t seem like a big enough word, does it?!). 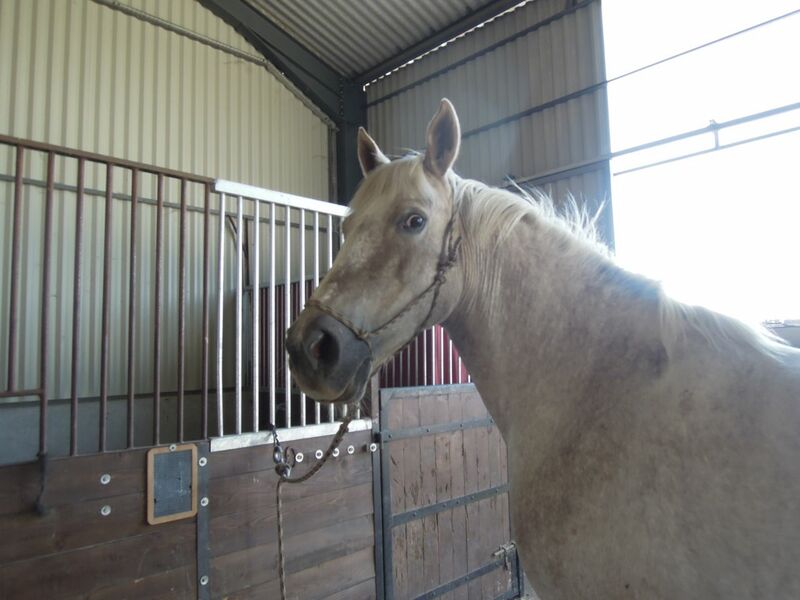 So when Eric the farrier suggested that she ask Mr Endurance (he’s a farrier as well as being a serious endurance rider) to have a look at it, she was relieved to get a second opinion. 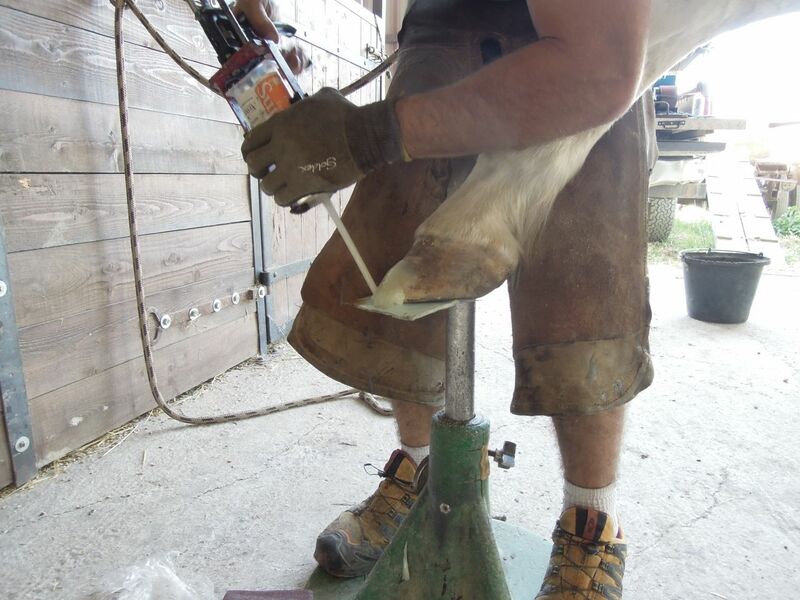 Mr Endurance said it was no problem and it hadn’t penetrated the sensitive structures of the hoof, but he would fill it with resin, which will hold it together and gradually grow out with the hoof. The resin sets in a minute – or less in warm weather – so he quickly wrapped it with cling film. 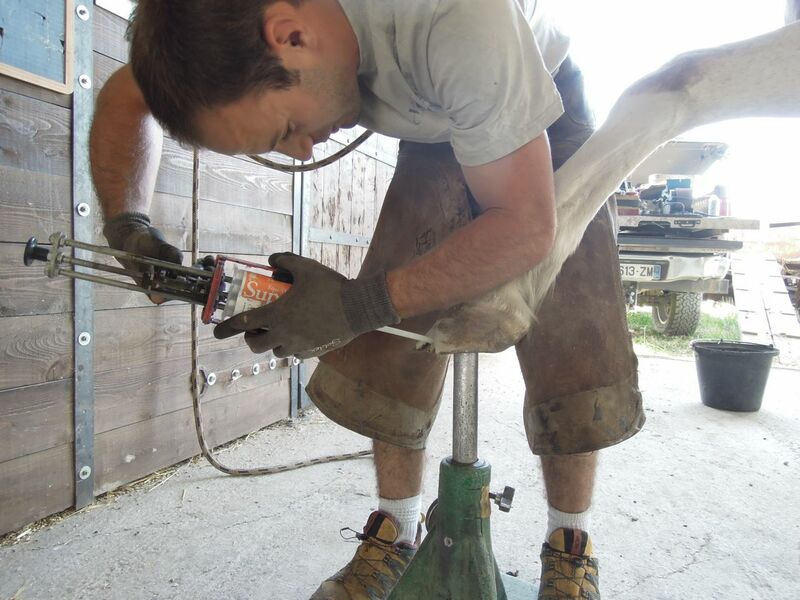 and set the hoof on the ground while it hardened. He needed to add a little more at the toe, this time with a piece of card underneath. …and Quieto looks very relieved that it’s all over. I was right. A bunch of wooden planks set at ground level were not a problem, although taking a photo of him standing on them was not easy! Then they all had a go at jumping over it. Although in Flurry’s case, it was more like stomping over it than jumping it. It’s a good job it’s made of durable rubber, not plastic, or there would be hoof-sized holes all over it! A good morning’s work, and well worth doing. Passerelles will worry no one next weekend. I hesitate to say anything, but, tell your friend to watch for any hint of lameness on that foot. It’s a lovely patch job, but if ther is any fungus or bacteria in there (the black stuff), covering it up like that creates a perfect breeding ground for it. It’s all anaerobic so leaving it open to air is the best cure. 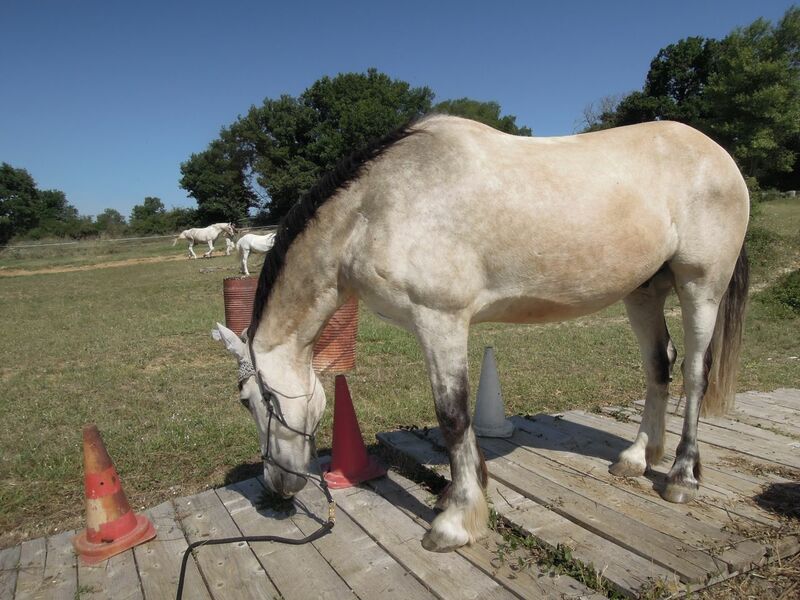 If the foot needs stabilizing, try an equicast. 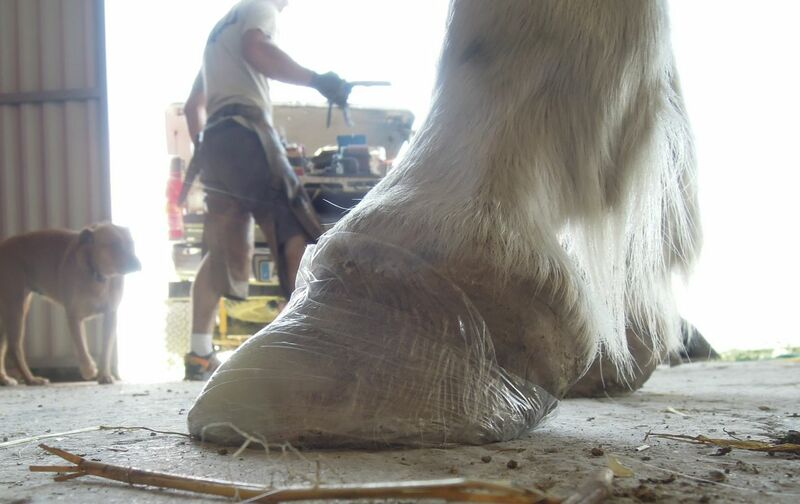 It will support the whole hoof and is breathable. Good luck with it and with your show. Thanks, I will say it to her for sure. She’s very worried about him. It really looked awful. Nice repair job. He does look relieved that it’s over with. Practicing ahead of time was a good idea. Bet you guys will ace the tests at the show. Good luck!